← You have how many kids? This is a follow-up post to the last one entitled, “you have how many kids?”. You should read that one first so you know the story of how we got to the place of having six kids and then this discussion will make more sense. Again, before I start this discussion I have to give another disclaimer. My point in this post is not to judge anyone or say that everyone should believe as we do, but just to say that I hope you can open your minds and hearts to a different way of thinking than what most of America thinks and appreciate where we are coming from. God is the one who leads you to the correct places in your life. If you read this in prayerful openness, I trust He will lead you where He wants your family to be, whether that lines up with our convictions or not. Notice what this verse does not say, it does not say, “Oh blessed are you parents when you only have two kids.” Or, “Children are a blessing but only if you can afford them and have the time to devote yourselves fully to each one by giving them crazy amounts of material goods and expensive electronics.” NO, it says, “blessed are you parents, with your quivers FULL of children.” Interesting. Again, it says God blessed them and told them to reproduce, but did not say how many kids they should have. There is no where in the Bible that says how many kids you should have. You are thinking, well that is just crazy talk. God said that for the people back in the Bible who didn’t have the blessing of birth control. No, they didn’t that is true, at least not in the forms we have it today. But since we are on the subject lets talk about birth control. Birth control comes in many forms, the most popular being a pill you can take to prevent pregnancy. It’s a medication to prevent something. Most medication are taken for preventing disease or curing disease, right? So, why do we take the steps to prevent children who are not diseases? The Bible clearly states they are blessings not diseases. They don’t need to be prevented. I did some reading, and found that birth control was illegal in this country until 1938. That’s when Margaret Sanger brought a lawsuit to the courts to repeal the law that said that birth control was illegal. Sanger felt that the only way women would ever become equal with men was to control how many children they would have. She founded Planned Parenthood which has become the largest abortion clinic in the country. Interestingly, up until 1938 all protestant and catholic churches also felt that any form of birth control was sinful. The Catholic Church has maintained its stance on birth control since then, but the protestant church began to change and sanction birth control. Why? There is no where in the Bible that states that birth control is wrong; therefore, most churches state they should not have an opinion about it. I get that. I am not saying they should, I am just bringing this history to light because I for one never thought about whether or not I should use birth control. Because the church had no stance against it or for it, I never developed my own opinion about it. I am encouraging people to form a conscious and informed opinion, not just go along with what everyone else is doing. -If you allow God to plan your family size, then you will have a bunch of kids. How will you afford to pay for those kids? Don’t you think that becomes irresponsible at some point? This is one I struggled with for a long while. It comes down to belief. I believe two things. One, that God does not just allow us to have as many kids as possible, but that he chooses each child individually for our family. Sam, Jordan, Josh, Elijah, Kaki and Luke were all made by God especially for our family and were not accidents. They are all blessings, as such God promises He will provide for our needs. Will we have everything we WANT? No. Will we have everything we NEED? Yes. God provides for us if we are obedient to him. Therefore, it is not irresponsible since we are not responsible for the providing. God is. It’s very popular in church to say we should trust God with our finances and stuff but only to the point where we are comfortable. Why not trust Him to provide the kids he wants our family to have and to trust him to provide the needs for those kids? That’s where real faith comes in. -What about quality time with your kids? How do you give so many kids quality time? First, it’s not hard if you live a simple lifestyle. This is one reason we are homeschooling some of our kids. It’s also another reason we limit our out-of-the-house activities. We believe that quality time is not spent by driving your kids from one activity to the next; it’s spent at family dinners and just having time to do “nothing” together. Our society has this idea that to spend time with your kids means doing some expensive activity with them. That is false. The best times are when you just spend time together doing something you all enjoy. We try to spend time with the kids one on one, but most of the time it is spent with small groups of kids. I don’t find anything wrong with that. Secondly, I think we spend too much “quality time” with our kids sometimes as a society. Yeah, I just said that. Kids can have the mistaken idea that they are the center of the universe. How does that happen? We put them there. We make too much of spending time with them. It is more important that they realize how to serve others and see to their needs than that they see how important they are. Kids naturally think they are important, we don’t need to teach them that. Just my two cents. -Would you pursue fertility drugs if God never blessed you with another child? No. Leaving your family size to God is about not trying to make things happen or not happen. It’s very stress free, really. It’s nice not to have to think about it. 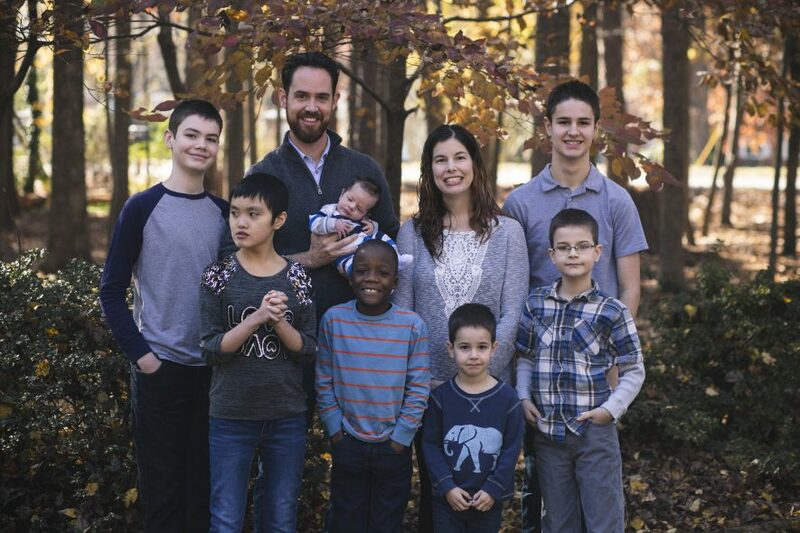 If we just have these six kids, we will be happy knowing God has fulfilled his plan for our family. And if we are blessed with more kids we will be happy also knowing God will bless us with the resources needed to provide for our family. -Where would you put more kids, your house is small? Think vertical. We are working to best lay out our house to fit our kids in comfortably and trust God to provide a larger house, if we have need of it. Really though, in the US we have the mistaken idea that we need crazy amounts of space to live in. The rest of the world lives in much less space. The size of your house has become a status symbol instead of a necessity. You can fit 6 kids in a 1500 square foot house; I will show you how. Just come on over. Yeah, most likely. We get that a lot. Our philosophy is to trust God with everything, that includes our family. That wasn’t crazy until the last 60 years or so, that was normal, and families with no kids where odd. Just something to think about. Again, lest you think otherwise, I am not telling anyone else what to think about family size. I am simply stating what we believe and how we came to this conclusion and encouraging you to examine this idea for yourselves and come to your own conclusion. Just have an opinion that is your own, and not some else’s. This is one of my favorite posts ever. We are growing baby #5, due shortly after Luke for those that don’t know me, and we might be “crazy” to some bc we don’t make a lot of money and live in about 1300sq.feet. We thought we were done at 4 kids. Then God spoke to joe that children are a blessing and our ability to have children is a blessing too, and that it isn’t our decision to do something permanent about it ( this was a very specific word for us, not an overall statement about surgical birth control). Then, a few months later, The Lord spoke to me that He will provide for whatever children he gives us, and that what we provide is enough. This was a time when I was concerned about whether or not we could “afford” another child. Several months later, we found out we were expecting #5! I don’t know if this is our last or not. I just know that God knows all of our needs and is taking care of us perfectly, in His way.